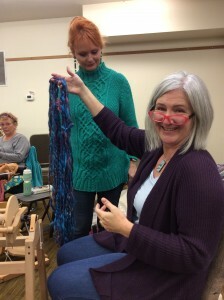 Oregon Flock and Fiber Festival Success! I don’t often enter things into the fiber arts show at the Oregon Flock and Fiber Festival (AKA OFFF), because it means delivering the items on Friday morning before everything is set up and returning to pick them up on Sunday afternoon. I like to go on Saturday, when it seems like the whole world is there browsing the booths, watching the competitions, and hanging out under the huge maple tree. But this year I decided to make the trip, having been encouraged by several people to do so. And, what the heck, I’m retired now, so I can make a 100-mile trip just to drop things off, I suppose. I entered the big blanket recently completed, the ruana I had entered into the Hand Weavers Guild exhibition, and the various skeins of yarn from the blanket (attached to the sample I wove on the table loom). The trip turned into an adventure with son Paul. After I filled out all the forms and entered my items and visited with everyone doing the same, I decided to call Paul. We had begun the search for a ‘new’ (replacement) spinet piano for our house by attending a piano sale the day before. We had not found anything that tempted us at the sale, so now it was time to look at Craigslist. Turns out there was a nice Baldwin spinet in Lebanon. So Paul met me along the I-5 freeway and off we went to Lebanon. Turns out this piano was up in the cascade foothills about an hour from the freeway–but of course we didn’t know that. Lovely people, original owners, but the piano itself had a terrible problem; it was sticky. Half an hour of heavy workout administered by Paul (it is always good to take a pianist when you shop for pianos) led to more stickiness, not less, and so we stepped away. But Lebanon is only 40 miles from Eugene, where there were 4 more Baldwins for sale. After many hours and many miles, we headed back home with a spinet in the back of Paul’s Honda Element. So my little trip to drop off my weaving became a very grand adventure indeed. Especially because, now that we have this improved and tuned piano, I have decided to learn how to play it. Boy does that eat into a person’s fiber arts time. 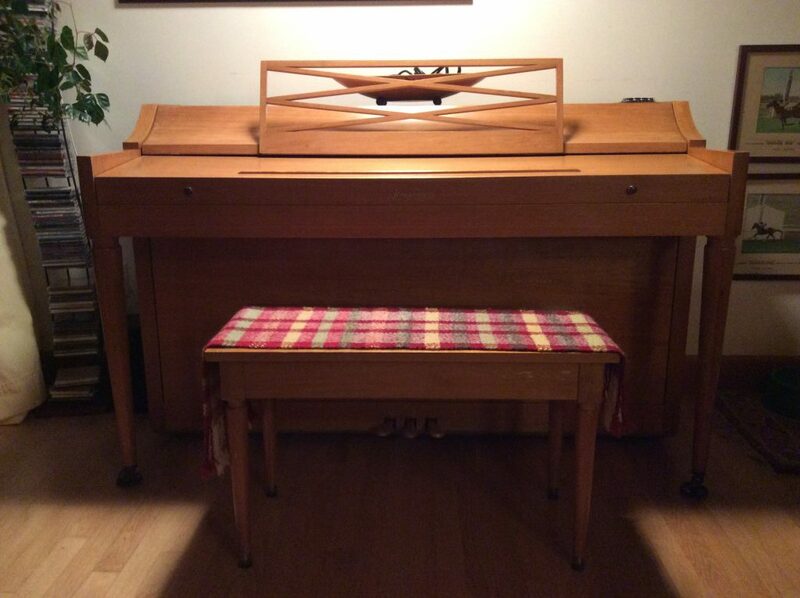 Here is the humble spinet in its new home. Pianos are like spinning wheels and looms: lovely, complex mechanical devices that enable us to express our creativity. The next day, while Paul and John and various friends installed the piano and removed the old one, friend and fellow fiber fanatic Catherine drove with me to Canby to enjoy the Festival. Of course we went upstairs to see the fiber arts exhibit and to find out if I had scored any ribbons. Yes indeed! 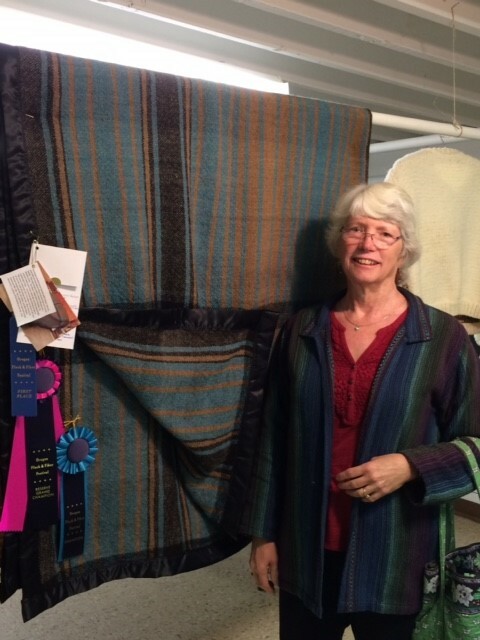 The blanket had 3 ribbons, including Reserve Grand Champion. 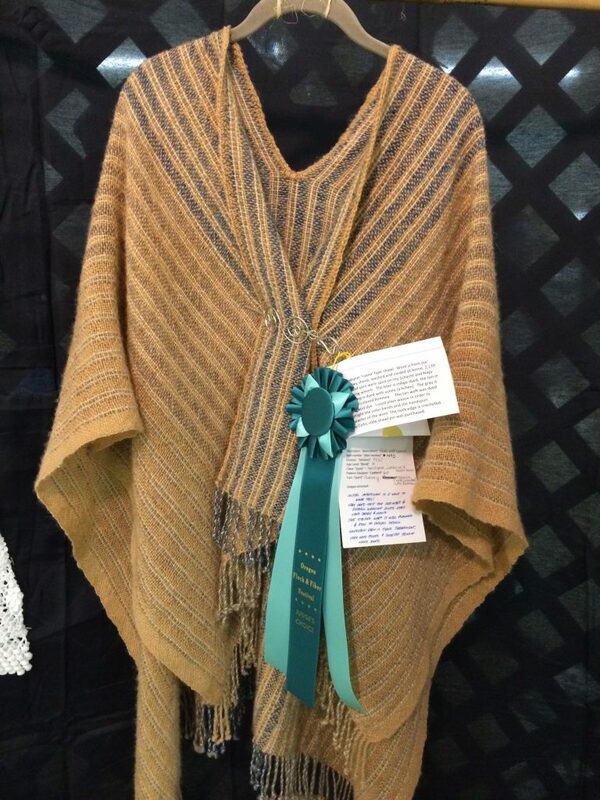 And the ruana received the “Judge’s Choice” award and a lovely note on the card that said, “I just wanted to wear this”. 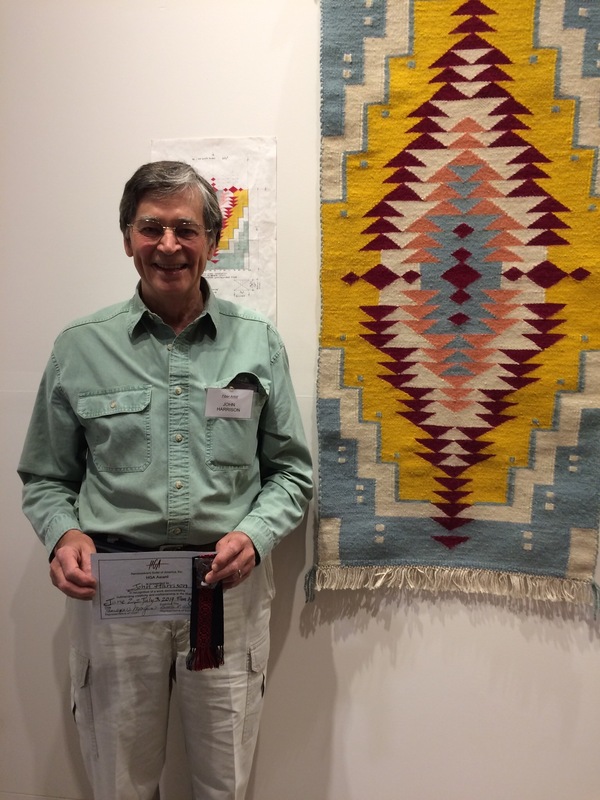 A week later, I received a certificate and a check from the Portland Handweaver’s Guild for “Best Handwoven” at the OFFF. It was humbling, encouraging and rewarding to receive positive feedback for my work. The show was very well presented, and there was lots of wonderful work on display. Since the theme was “lace” there were exquisite knitted shawls as well as examples of the many other techniques that create lace. In beautiful fiber creations of all types. In March I posted that I was getting ready to weave my third handspun, doubleweave blanket. I added a photo of the warp yarns, looking as if they were ready to hop onto the loom. But in reality, I did not complete the warp until the end of May, when we were getting ready to take our entire family of 11 to Sydney, Australia to join John’s extended family for his mother’s 100th birthday. Yes, really–and Ina Harrison stood before us all and gave a brilliant speech in which she responded to the two essential questions of the centenarian: What does it feel like to be 100? And – What advice do you have for the rest of us? It was a great party with entertainment provided by the families of each of Ina’s children. For the Harrisons from Oregon, the entertainment involved wearing fake beards made of Romney locks needle felted onto food service beard nets and the wearing of a ‘wig’ made from natural colored Romney locks attached to a knitted stocking cap. So that is why I did not start weaving until late in June. The weaving, even on a big project like this, goes quickly. In 3 weeks the blanket came off the loom. 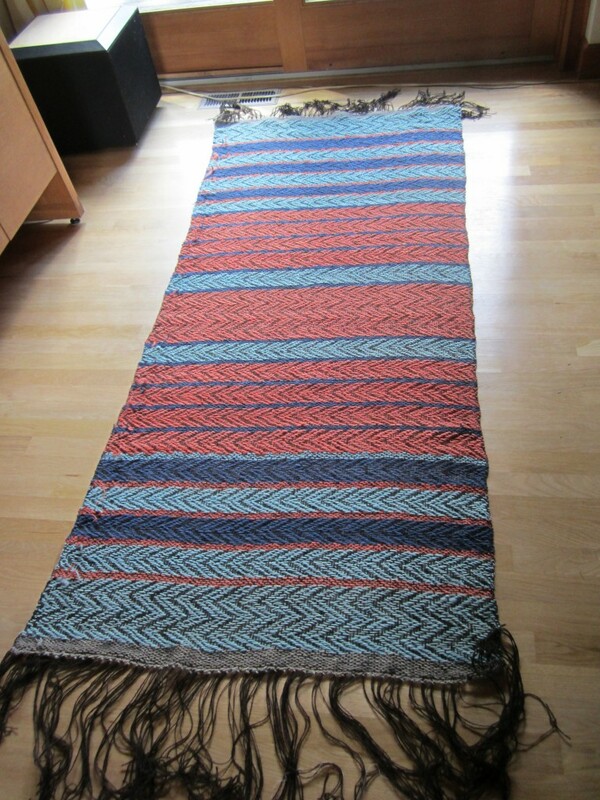 Here it is, still folded in half lengthwise as it was woven. Late in the design process I decided to try using a fibonacci sequence for my two main colors–turquoise and light brown or tan. This required lots of internet research and graph paper as I tried to figure out how the sequence could be applied to a warp with nearly 700 threads, only half of which would be visible to me during the weaving process. I hand-washed the blanket (in the bathtub), spun the water out in the washing machine, and dried it on a delicate setting for about 20 minutes. Then it was hung over a thick curtain rod overnight. I steamed it using an iron and damp cotton cloth, and after each section was steamed, I brushed the surface to create a soft, fulled effect without losing more size. 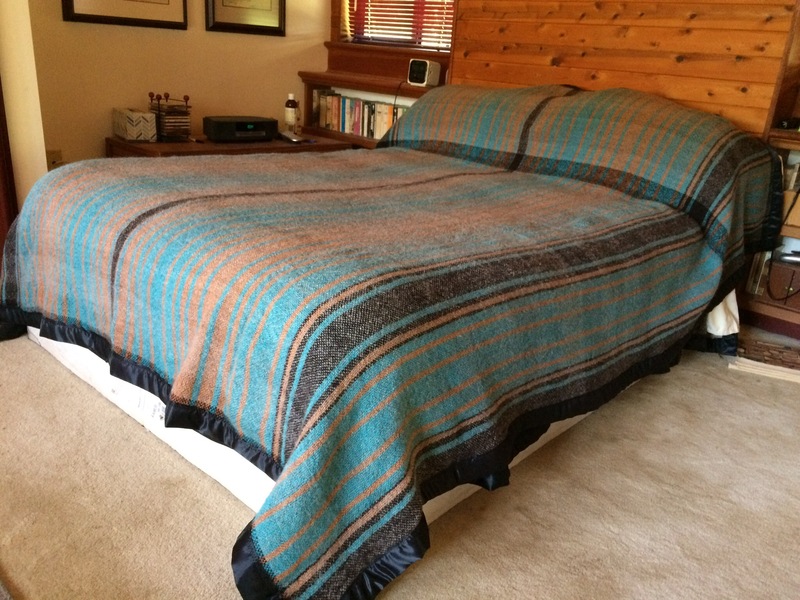 It was challenging to estimate how much the blanket would shrink and therefore where to place the black stripes that were supposed to define the edge of the bed. The warp was measured at 136″ long, and the width in the reed was 46″ x 2 or 92″. The woven length (after loom waste and normal contraction) was 112″ long and 90″ wide. 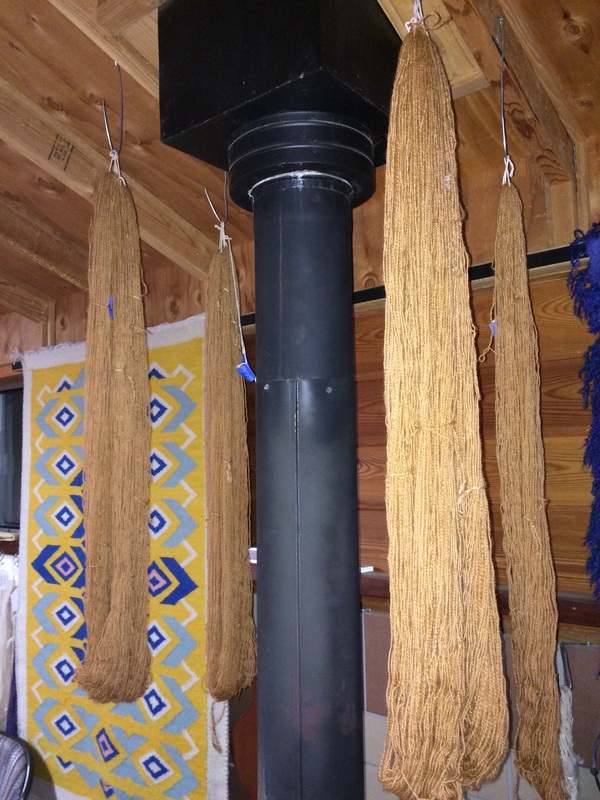 After fulling and steaming, it is 97″ long and 87″ wide. Below are two photos to show how it turned out. 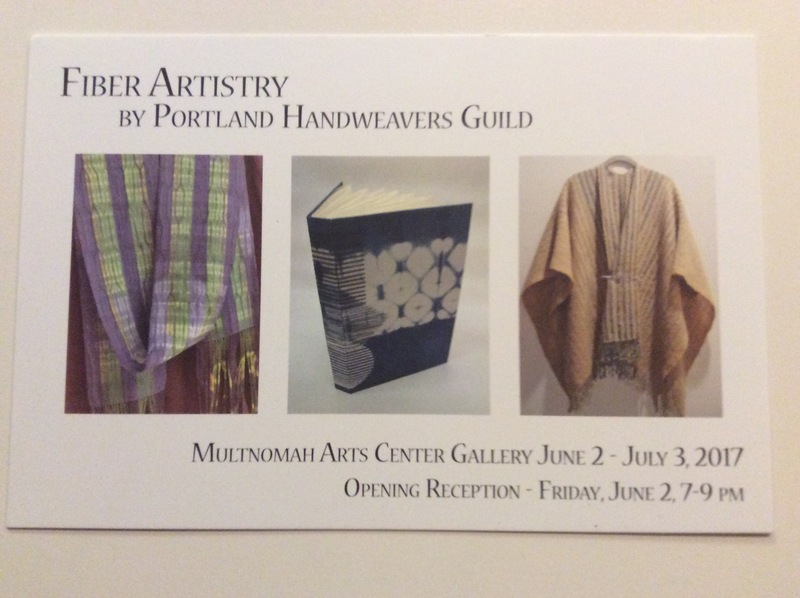 In April, we sent off photos and descriptions of one weaving each to the Multnomah Arts Center in Portland. They were planning an exhibition on Fiber Artistry for the month of June. Soon we heard back that our pieces had been accepted. We were given more instructions–how to label our work, when to deliver it, etc. Fortunately the delivery date and the opening reception were both scheduled for the week before we planned to depart for Australia. We enjoyed the opening reception. There were many excellent weavings and it was delightful to talk with the artists about their work. We met Peg Silloway, the main organizer of the exhibition. There was also an interesting woman named Barbara who asked wonderful questions and made positive comments about everyone’s work. On her nametag it said “Juror,” but we didn’t know what that meant. We were thinking it was almost time to go when Peg called for everyone’s attention. She introduced Barbara Pickett, who was at the exhibition representing the Handweavers Guild of America. So Barbara, Associate Professor Emeritus of the Art Department at the University of Oregon, was here on official business–to judge our work! She spoke very positively of the quality of the weaving she saw in the exhibit. Then she spoke at some length about the piece that she felt stood out as deserving the HGA’s excellence award. This piece respected tradition as well as adding new ideas to it, seemed to tell a story, and the color choices were, in her view, ‘spiritual.’ She noted that it was woven of hand-spun wool and acknowledged the challenges involved in that as well. Who was the weaver? Our own John Harrison! He says, “You could have knocked me over with a feather!” Needless to say, the weavers at the Damascus Fiber Arts school are very proud of John and excited for him. They said, “No more claiming you are a novice!” Here is a photo of John with his ribbon and certificate. 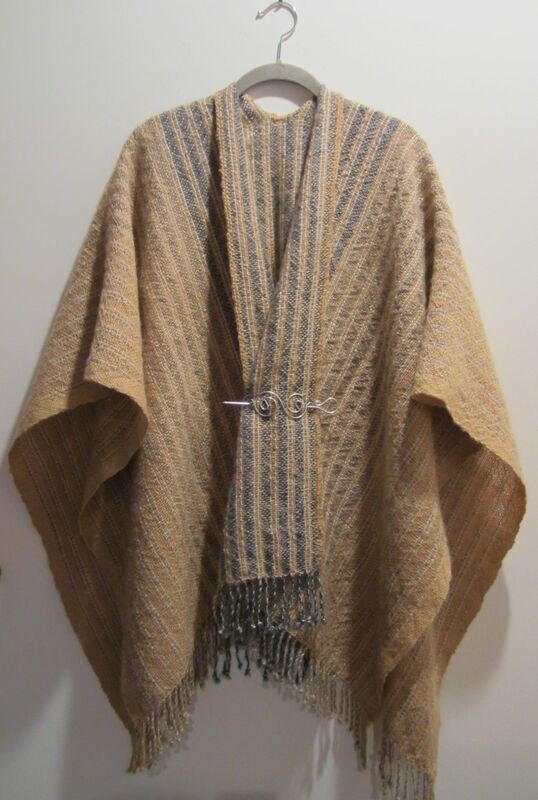 His weaving will appear early next year in the magazine of the Handweavers Guild of America. It truly is a beautiful weaving. 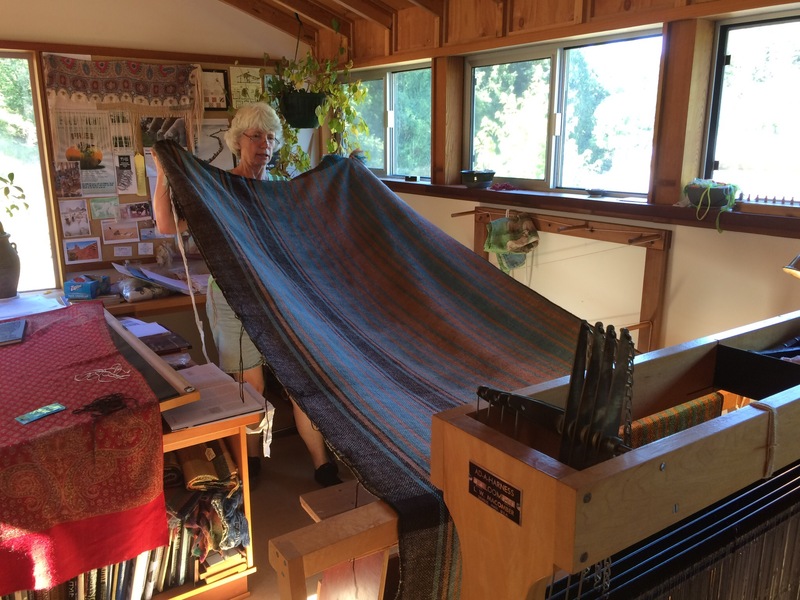 At the urging of fellow weaver Phoebe, John and I both submitted entries to the Portland Handweavers Guild for an exhibition that will be set up in June at the Multnomah Arts Center. This was our first time to photograph our work, write a couple of paragraphs about it, and submit various paperwork to the guild. If accepted, our pieces will be on display along with the work of lots of other weavers. John submitted his latest, “After the Klagetoh”. 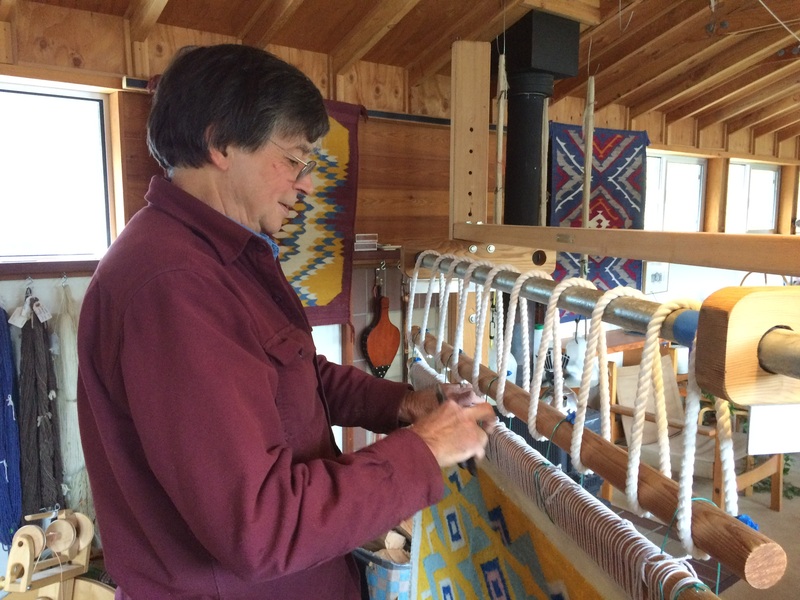 John always plans his weaving carefully, thanks to his career as an architect. He intends to include the drawing of this rug as well. After he draws and colors half of the design, he can make a color copy and tape the two together to see how the whole rug will look. 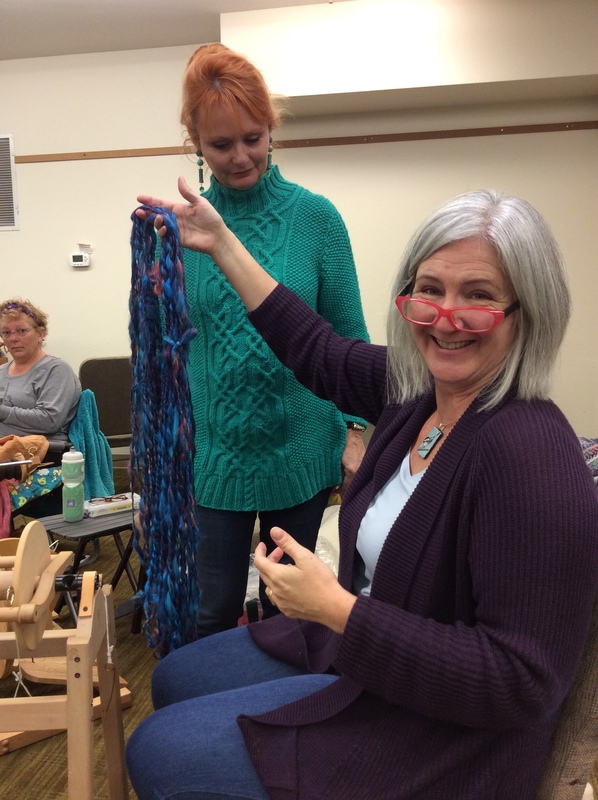 I submitted the ruana I wove in 2016. 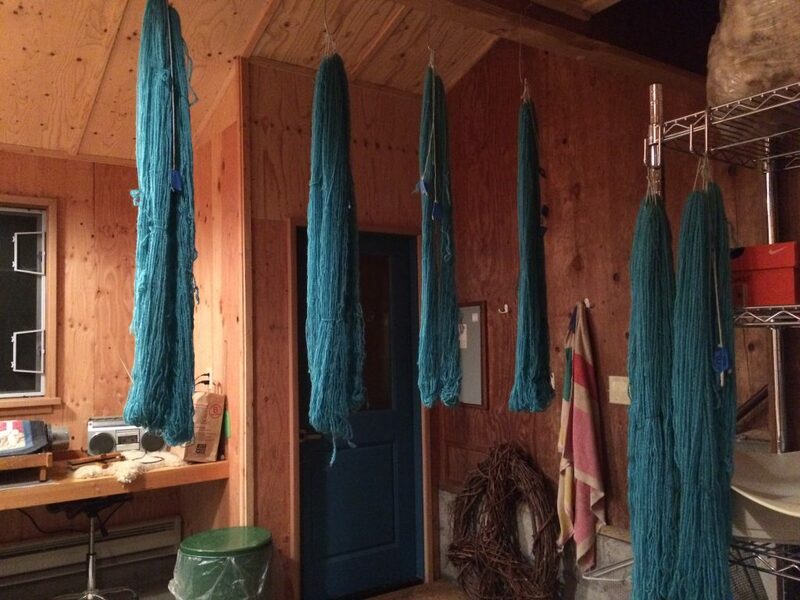 The warp yarns were dyed with indigo and lichen known as usnea. I had just two skeins of the indigo, so I concentrated the blue toward the middle of the ruana. I made a spreadsheet to inventory my yarns, calculate lengths needed, and to plan the pattern. A useful tool for a floor loom weaver, but not a part of the work of art like John’s architectural drawings. I found the shawl pin at a fiber arts supply store on line–it’s perfect with this shawl. “After the Klagetoh” is finished! Ring the bell! John has finished a new piece. 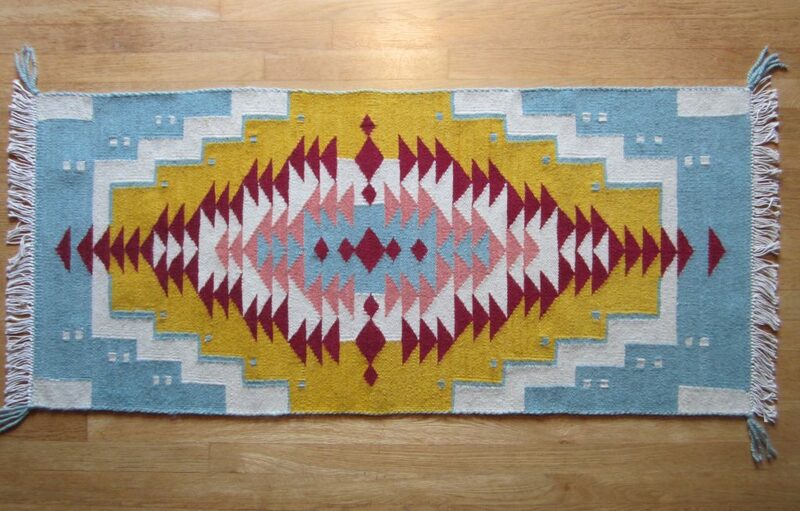 It was inspired by weavings of the Klagetoh people on the Navajo reservation. The piece is 24 inches wide and 54 inches long. Someone asked “how long did it take you to weave it?” It’s a difficult question to answer. First, the sheep have to grow the wool. Then we need to shear the sheep and wash the wool. John draws up many possibilities before settling on the final design. Once that is determined I can proceed to spin the yarn he needs. Then he dyes the yarn according to his design. 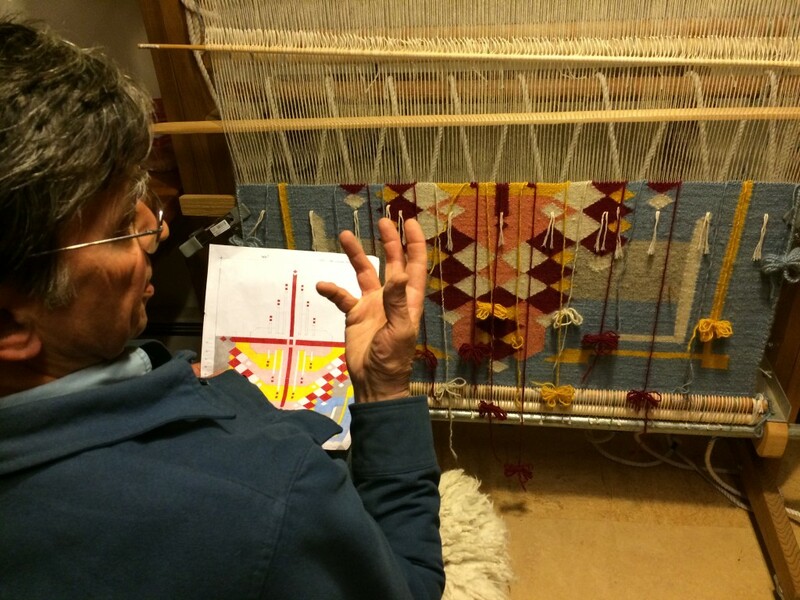 In this case, he began actually weaving in late November, and removed the finished rug on April 1st. He thought this piece went very quickly because of the narrower width. For the first time, I went to the Portland Handweavers Guild retreat. About 16 people gathered at the Cedar Ridge Center in Vernonia, which is a basketball camp for kids. 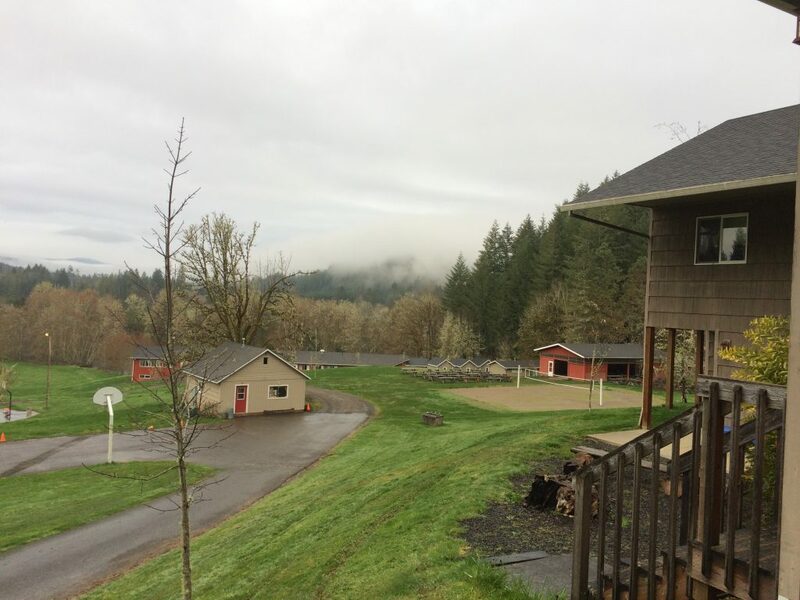 It suited us perfectly–lots and lots of bunk rooms, a huge dining hall with plenty of space for us to spread out all our stuff, good food and a beautiful setting. It was amazing to see what people brought. 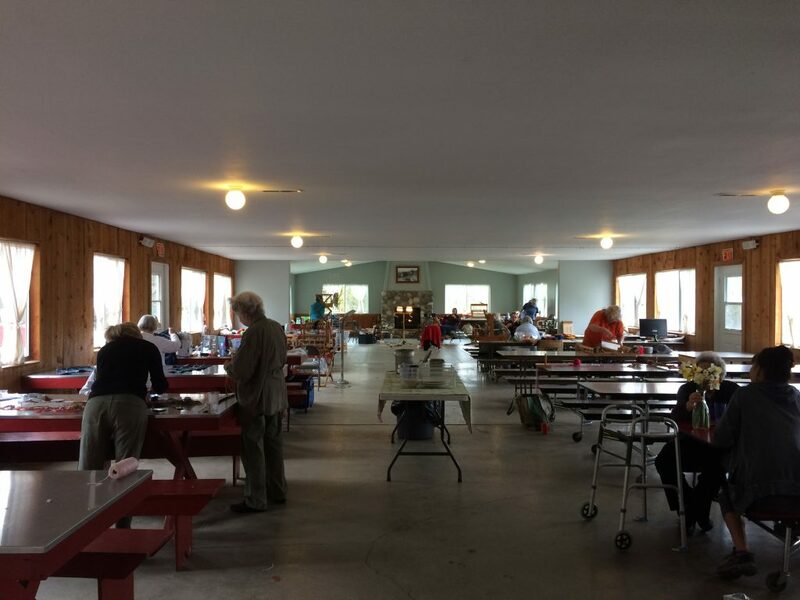 Looms of all sizes and types, a sock machine, some amazing antique spinning wheels, sewing machines, and lots and lots of projects. 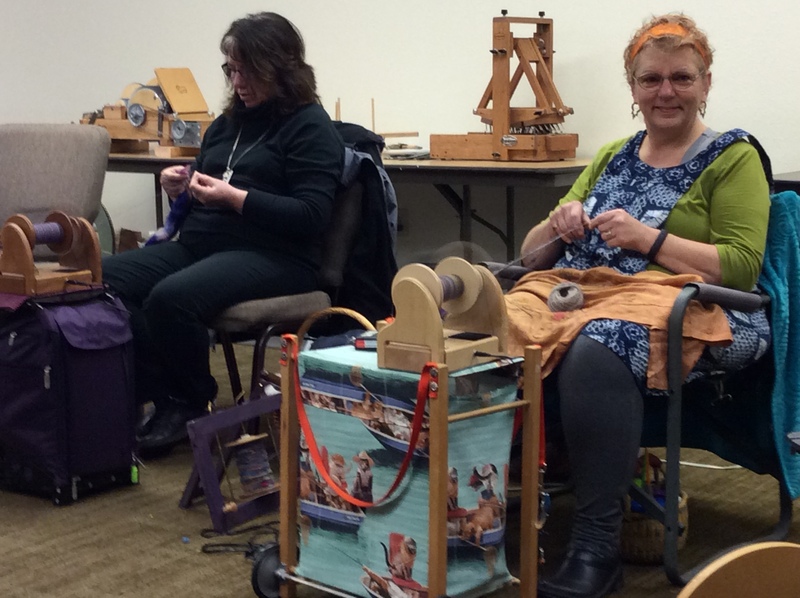 I took my table loom and a spinning wheel. I was determined to get a small project on the loom and tossed a bag of yarn into the car with absolutely no plan. It was wonderful getting to know the people, getting help and ideas from such creative, experienced and knowledgeable folks. Sleeping areas at the top of the hill next to the camera; the dining hall is the low red building far below. I established myself in this corner next to the window. Right next to the fireplace, I had room for all my loot. Here is the long view of the dining hall–you can see it is cavernous! The hosts provided extra lights which we directed up to the ceiling. Several people brought their own task lighting as well. With help from Stephanie I decided on a red and white warp. Now, what to weave as weft? That was a big challenge. I decided to use multi-colored yarn I had made several years ago. But when I began weaving, it looked awful. Red on red and white, no sense of pattern. So I un-wove the three inches I had done and started over. This time I created color bands. Much better! I’m calling this my “tablecloth scarf”. 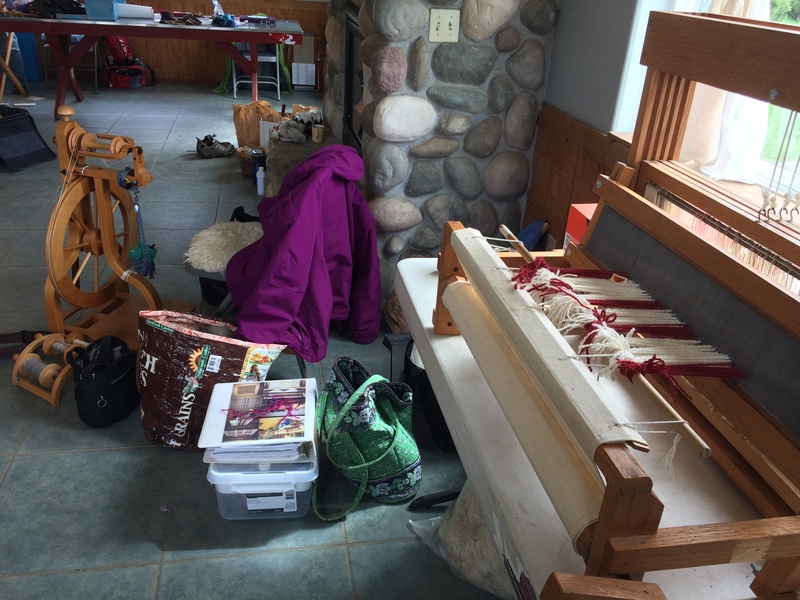 I know there are weavers out there who warp a loom and weave a project in a day or two. I have to sneak up on it slowly. Because I use all hand-spun yarns, there are many weeks of spinning to build the inventory for a large project. I make a spreadsheet to determine how much yarn will be needed for warp and weft. The design goes through many phases of development too. For this blanket, the warp will have three colors and the weft will be all natural gray. For the dyed wool, I used Reyna’s fleece. It was a lamb’s fleece and lovely to spin. For the gray, I used Rufus’s 2016 fleece blended with some lighter gray from a Merino Cross fleece that I purchased at the Black Sheep Gathering and split with friend Catherine Crooker. It made the yarn softer in feel and lighter in color. For the black, I used the Black Welsh Mountain roving I bought from Judy Sleavin, a new member of the Aurora Guild who attended this year’s winter retreat. The Welsh wool is more primitive, and had been prepared by Columbia Scouring so that I could spin it from the inch-thick roving ‘rope’ Columbia had created. Dyeing 12 skeins one color is a challenge. You fill a big pot, calculate how much dye powder to mix in, soak the yarn to get it wet, then try to submerge it all at once and circulate the dye throughout without agitating too much or losing all your labels in the soup. Once the turquoise and brown yarns were dyed, I could lay out the colors and see how it all looks together. 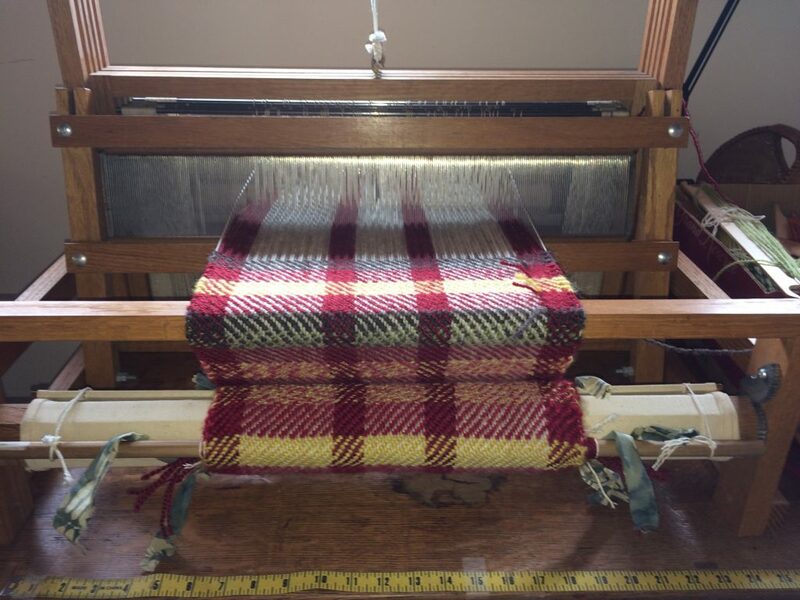 I’ve saved out small amounts to weave a sample on the table loom before taking the plunge on the big loom. What do you think? Will the gray weft take too much away from the lovely turquoise, or will it make a lovely blanket? We will soon find out. 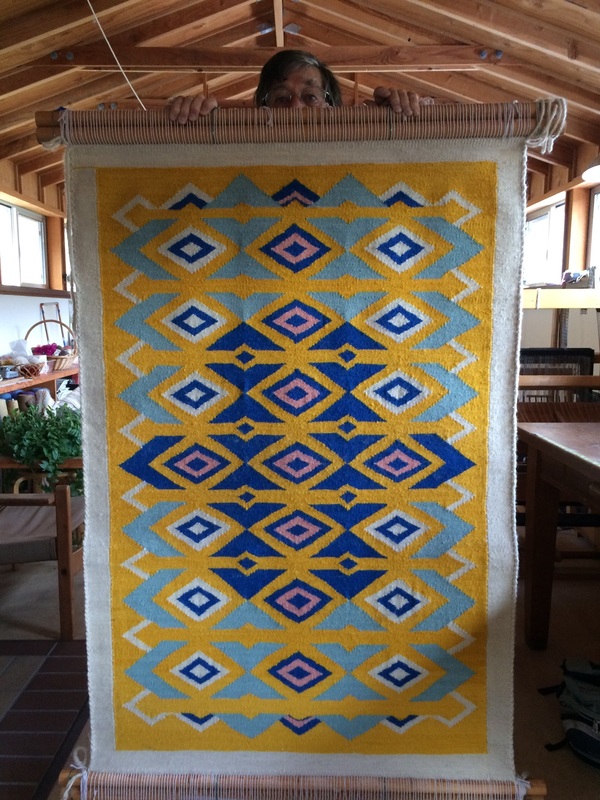 For much of 2016, John worked on this rug, titled “From a Border” on his loom at home. The design was inspired by a Pueblo embroidery border motif. It came off the loom in the fall of 2016. Here he is getting ready to take it off the loom. Voila! Here it is, before finishing touches and fringe. At last, I have finished spinning the five pounds of yarn I will need for my next blanket project! This time, it will be plenty long, because I measured the bed and allowed for shrinkage and tucking in. 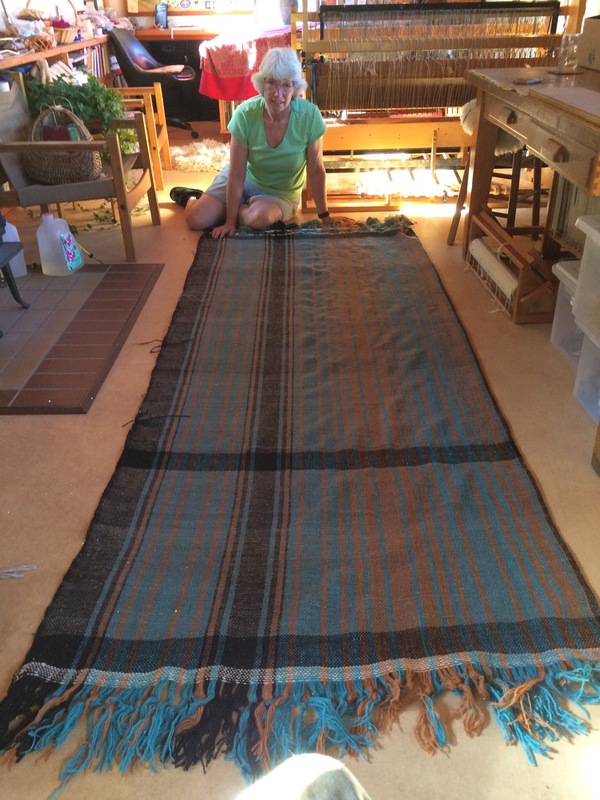 It will be woven double-width, so the width of the loom limits the width of the blanket to about 82 inches after washing/fulling. Good thing we have a double bed. I’ll be using some black yarn from Judy’s Black Welsh Mountain sheep, some gray yarn from our Rufus blended with a purchased merino cross light gray fleece, and some white yarns that will be dyed with acid dyes. Yesterday, I gathered up my courage and dyed the yarns. 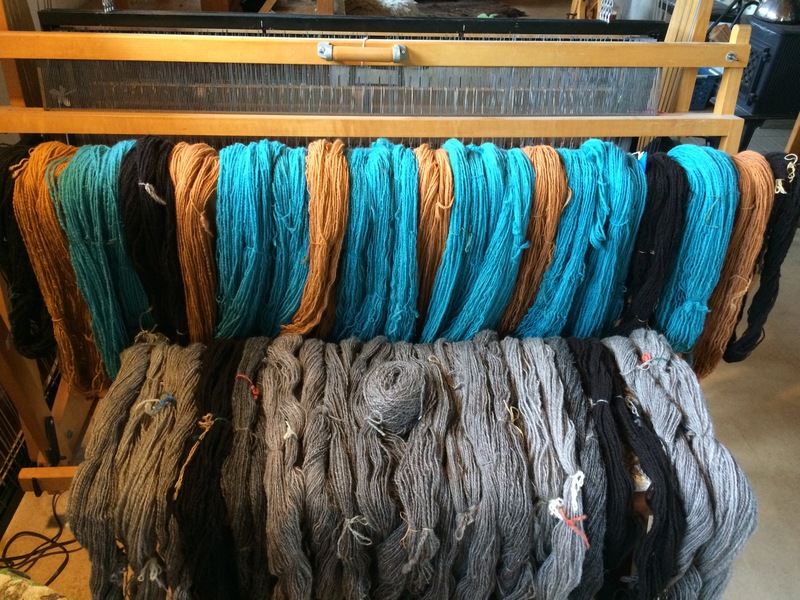 There were 12 skeins to be dyed turquoise (Aussie Landscapes dye called “Ice”) and 7 to be dyed a light tan (Judith Mackenzie’s “worker brown”. I even tested the dyes on small skeins I’ll use to weave a sample on the table loom. Things went ok, except that the brown was a bit dark and I was not sure why. I decided to make the dye bath about 1/4 strength to keep the final dye light. But the math wasn’t easy, and things did not look right. I was getting nervous, wondering if I have forgotten how to do basic arithmetic. Finally I understood the problem: one set of dyes work on a 10% basis, meaning dye powder is weighed out at 10% of the fiber weight. The other set are weighed at 1%. So yes, I had missed a decimal point, but it was because the dyes are different. John continues to work on two projects, one at home and one at the Damascus Fiber Arts School. The tightly packed rugs take many months to complete. 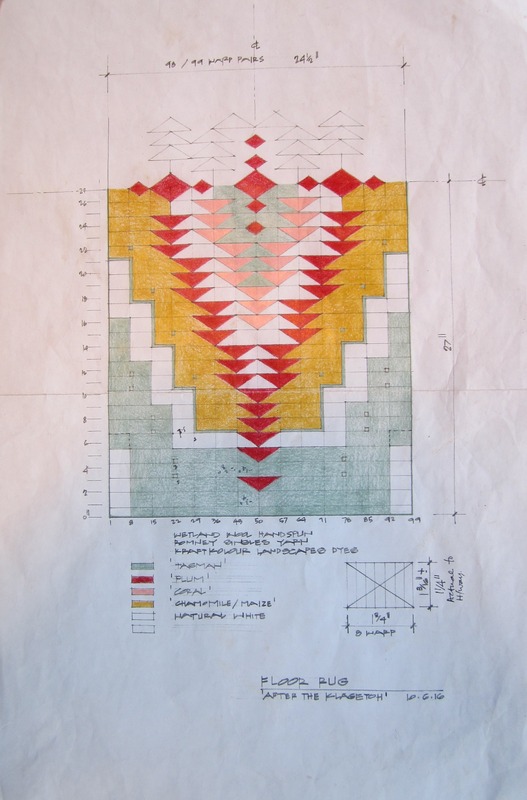 In this photo you can see how John’s architectural drafting skills contribute to his weaving. He takes plenty of time to create the design, then prints out several copies so he can try different color schemes. There are always adjustments to be made once the weaving it underway, but it’s essential to start with a good plan. The challenges at the floor loom seem a bit different. I decided to weave a “leftovers” piece, using leftover yarns from John’s tapestries for the weft and some finely spun two-ply dark brown weft yarn made from Jan and Jeff Jacqua’s Jacob fleeces. I planned to space the warps wide–4 per inch–to give the thick Romney yarns lots of room to celebrate their color and texture. 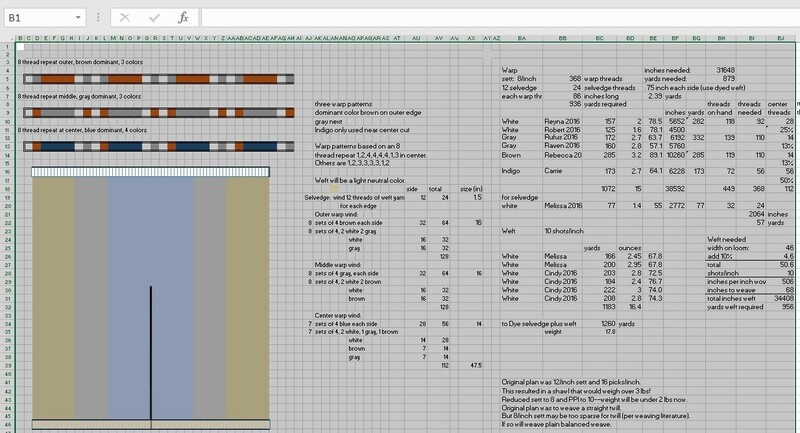 I use a spreadsheet rather than a drawing to record all the yarns and determine the sequence of colors and treadling patterns that I will use. With this weaving, after two inches I knew I needed to rethink my plan. Rather than packing it firmly, I decided to lay the yarns in very gently, allowing a lot of space in both directions. Here is what it looked like on the loom. 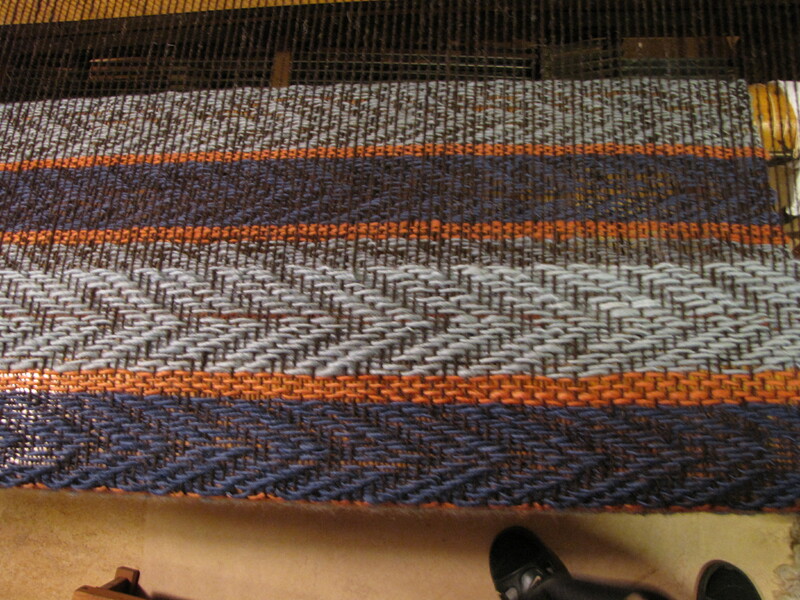 On the loom, this piece was sett at 42 inches wide and the warp was 3 yards long. 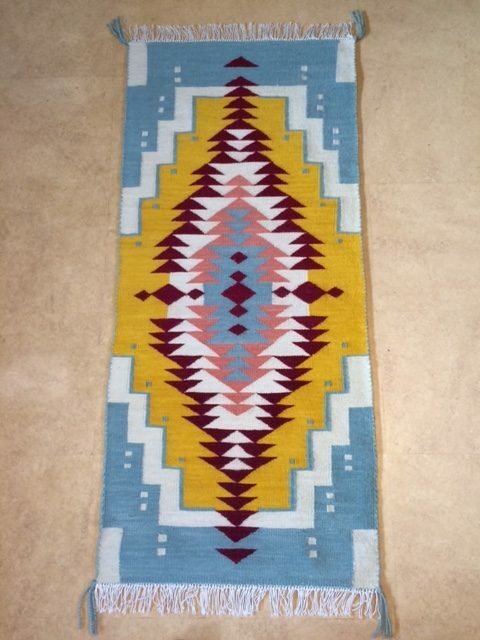 Off the loom, it quickly pulled in to 35 inches wide. But once it was fulled (washed in very warm water and hung to dry), its character changed. Now just 27 inches wide, the fabric is very thick and the twill patterns are less evident. I was determined not to worry about “what it is.” But looking at the fabric, I am thinking of a couple of big couch pillows with these beautiful colors. And here they are. I left the fringes on and rolled up an old feather pillow inside each one, then hand-stitched the bolster-type pillow. I (Marilyn) am not an accomplished knitter. It has to be simple or I will be ripping it out over and over, especially since I only knit when watching TV. I so admire beautiful lace and cables, but I stick to the basics. I managed to knit a new hat, three pairs of finger-less gloves, and a vest, all with hand-spun yarn. 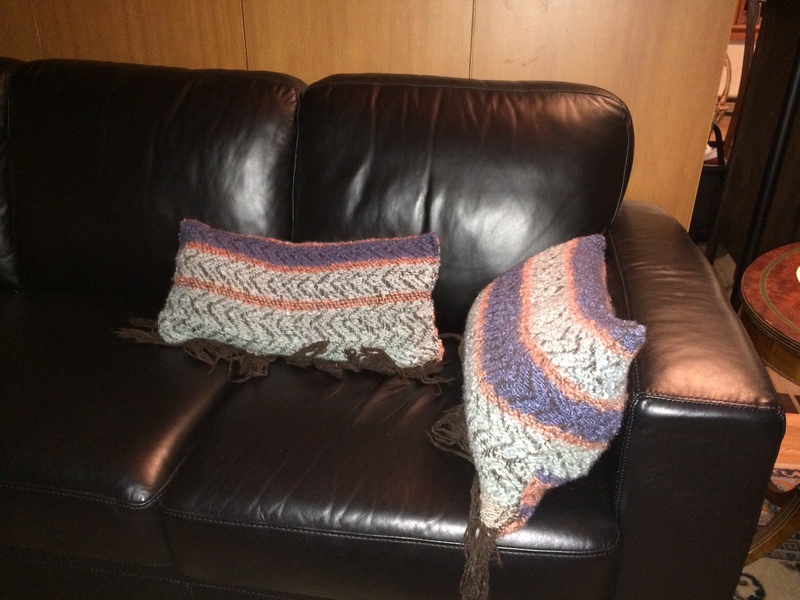 Knitting side-to-side goes quickly and produces vertical stripes, which are necessary for my shape! 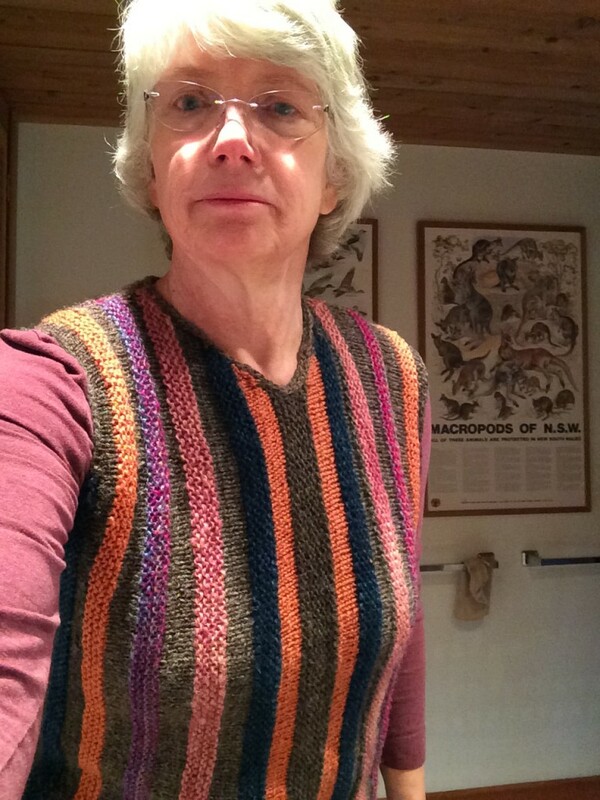 A selfie of the new vest. is a small family farm raising Romney sheep for wool and related products.